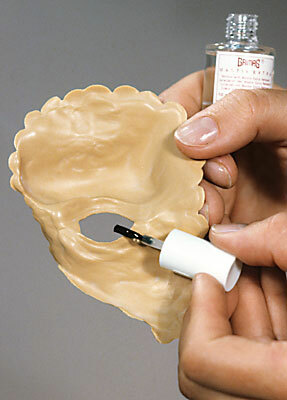 Take a Grimas Artificial Eye and apply Mastix Extra on the back to glue it into the application. For a good adhesion you press the eye into the glued edge, remove it for a couple of seconds so that some oxygen can get in and then you stick the eye on firmly. Pre-colour the eye patch with Camouflage Make-up in the same pale shade you will use next for the whole face. Place the applications on the skin to get an impression of whether the edges are a good fit and where it is going to be glued on. Apply Transparent Powder to where the edge merges into the skin to mark out the exact spot.